During March, Highland Presbyterian Church is joining area PCUSA churches to collect specific items needed for Presbyterian Disaster Assistance Hygiene Kits. These kits will be ready to use by PDA whenever disaster strikes. Please bring your donations to the marked boxes at church. Plans to assemble the kits will be announced in April. Hand towels (16”x28” only), Single Toothbrushes (in original package), washcloths, bars of bath soap (in wrapper), Band-Aids, nail clippers, and wide-tooth combs. Family finds sanctuary with a Louisville church and the resettlement agency it helped found. Newly arrived Syrian refugees, Shadi and Hanadi Antakli with daughter Tuqa and son Hasan, at their Louisville home. At a time when many countries are closing their borders to refugees fleeing war in Syria, one Presbyterian congregation in Kentucky has opened its doors, offering a home—and a chance at a future—to a Syrian family. 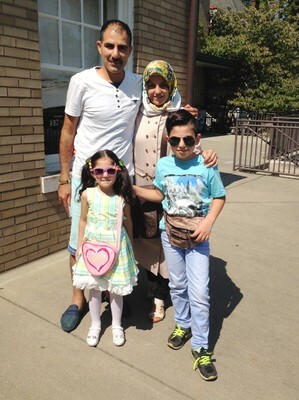 On Aug. 20, members of Highland Presbyterian Church gathered at the Louisville airport to greet the newest refugees to arrive in the area, Shadi and Hanadi Antakli and their five-year-old daughter Tuqa and 10-year-old son Hasan. After piling into cars, the volunteers drove the Antaklis to their new house. When they arrived, the doors of their new home were open, and the lights were on. Inside, more volunteers waited to greet the Antaklis. The pantries were stocked. Food from their homeland was cooking on the stove. And warm beds were waiting. At the time, it had been more than two years since the Antaklis fled their home in Aleppo, Syria, in 2013. When Aleppo’s schools closed and medical services became hard to find, the Antaklis decided it was time to leave. “At the moment we felt our children [were] unsafe . . . [we] had to leave the country,” Shadi told a reporter from WAVE 3 News. For the next few years, the Antaklis shared a small, crowded apartment in Istanbul, Turkey, with three other families. Cost of living was high, and survival was day to day. Finally, after a long process with the United Nations and Church World Service, the Antaklis boarded a plane to the United States to connect with Kentucky Refugee Ministries (KRM). KRM, which houses its Louisville office at Highland Presbyterian, helps resettle refugees who have been legally admitted to the United States as victims of warfare or persecution. Though now a fully independent non-profit organization, KRM is supported with volunteers and funding from Highland Presbyterian, as well as from many other faith communities and organizations in the area. KRM traces its founding back to Highland when, in 1990, congregation member Donna Craig felt a call—after traveling to Nicaragua and witnessing the partly U.S.-sponsored violence there—to help people escaping dangerous places. Highland sponsors a family each year, and this year they wanted to support a Syrian family. They heard about the violence that began sweeping Syria in 2011, eventually leaving more than 200,000 people dead and 7.6 million displaced from their homes. After spending two months preparing for the Antaklis’ arrival, the team of more than 15 volunteers is now helping the family adjust and access resources, such as the local community center and a class at Highland that teaches refugee women how to use an electric sewing machine. They take the parents to a halal grocery store and job interviews while others walk their kids to the school bus. The goal is eventual independence. “We don’t do anything they won’t be able to sustain on their own,” says Nickel. Members of Highland Presbyterian know there are millions of other families in need of help. “To help just one seems like so little,” says Campbell. “But it’s something.” And that “something” is part of a much larger effort orchestrated not only by KRM but also by Presbyterian World Mission. That’s why World Mission is partnering with the National Evangelical Synod of Syria and Lebanon to create a safe and thriving Syria. With the help of the newly formed Syria-Lebanon Partnership Network, U.S. Presbyterians are teaming up with Christian partners in the area to rebuild houses and schools, organize major relief appeals, and advocate for change through the Presbyterian Ministry at the United Nations. Click here to read Stated Clerk Gradye Parsons’s letter urging prayer and recommitment to refugees.